The knee is unfortunately very susceptible to injury and can therefore affect individuals of any age. Activities such as playing sports, gardening or working in jobs that require kneeling on hard surfaces are common causes for knee injuries. Below we shall discuss the most common causes for knee pain and look at how the OSMO Patch which is natural and drug free can help to relieve your pain. Is knee pain affecting your work… exercise… or lifestyle? Did you know that along with shoulder pain, knee pain would seem to account for one of the main causes of pain which directly impacts on the actual activities, work and lifestyle of many active individuals? Before your knee injury were you generally an active person? Individuals that are physically active or have jobs that require kneeling on hard surfaces are the most susceptible to knee pain caused by injury due to repetitive stress or impact to the knee. If you fall into this category then you already know that this can understandably be quite upsetting and frustrating as you were previously an active person. As some activities, jobs or sporting commitments may not be possible to give up or easily avoided, many people push through the pain… which will often result in further pain or a secondary injury. Are you feeling frustrated and does it seem unfair that your injury occurred while participating in a healthy activity? Did you realise that identifying if your knee pain is acute or chronic may actually help expedite your recovery? Often knee pain will not be noticeable unless you move your leg or knee in a certain direction or until you apply pressure or weight to the knee. Alternatively you could be experiencing ongoing intense knee pain even whilst resting. Either way, pain from a knee injury can be quite intense as you may unfortunately already know. Have a read of the list below; we have included some of the most common causes of knee pain. Once you have identified your injury from the list simply click on link to discover some of the possible activities or causes that should be avoided to reduce the risk of further injury. We will also look at some of the existing treatment options… and see how the OSMO Patch, our 1oo% Natural treatment may be ideal for supporting the reduction of swelling, inflammation and pain caused by many of these common knee injuries. You may also wish to watch the video to the right to learn exactly how the OSMO Patch works. Common Causes of Knee Pain. It can be said that most knee pain causes fall into four main categories: tendon tear or inflammation (bursitis or tendinitis), instability, wear & tear or fracture. There are several small fluid filled sacs around the knee. They act as cushions between the bones and overlying soft tissues. These cushions help to reduce friction between the muscles and bones. Sudden impact or stress due to overuse will often cause these sacs to become inflamed and fill with fluid. This condition is known as knee bursitis and will often cause considerable pain. Bursitis knee pain is classified as either; Pes anserine Bursitis, Prepatellar Bursitis, Infrapatellar Bursitis or Suprapatellar Bursitis depending on the area of the knee that is affected. For further information and to discover how the OSMO Patch can help relieve swelling and the associated pain due to medically diagnosed knee bursitis simply click on the link below. A baker’s cyst, also known as a Popliteal Cyst occurs when a pouch of synovial fluid balloons out from the synovial joint at the back of the knee. A baker’s cyst can be very painful and can even rupture over time. For further information and to discover how the OSMO Patch can help relieve swelling and the associated pain due to a medically diagnosed baker’s cyst simply click on the link below. A swollen knee due to fluid around the knee is normally the result of a soft tissue injury. Knee swelling can be very uncomfortable, painful and also restrict the movement of the knee itself. For further information and to discover how the OSMO Patch can help simply click on the link below. The tendons in the knee can undergo extreme loads and strain both sudden as well as over time. Due to wearing of tendons in this area knee tendonitis is a common injury. Tendonitis is normally quite painful and should not be ignored. For further information and to discover how the OSMO Patch can help relieve swelling and the associated pain due to medically diagnosed knee tendonitis simply click on the link below. Instability in the knee can cause movement in the knee cap. This condition usually occurs due to overuse, overweight, poor posture, or a past knee injury Treatment should normally include physical therapy and rehab and may depend on age as well as the underlying cause. In addition to strengthening exercises often cortisone injections and anti-inflammatory medication is used. 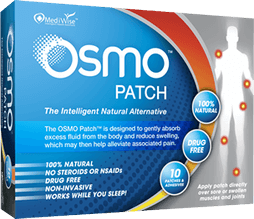 The OSMO Patch is a great natural alternative to painful cortisone injections and anti-inflammatory medication. Knee pain may also be caused by wear & tear in the knee. This will commonly tend to cause irritation and inflammation leading to knee bursitis or a baker’s cyst. For further information and to discover how the OSMO Patch can help relieve swelling and the associated pain due to medically diagnosed wear & tear injuries such as knee bursitis or baker’s cyst simply click on the link below. Fractures and breaks in the knee will usually cause extreme you should consult your health care professional as soon as possible if you are experiencing this type of pain.